According to Energy.gov, the average American household wastes energy due to drafts, air leaks and inefficient heating or cooling systems. Much of this energy is lost through windows. Replacing windows with new, energy-efficient models helps maintain a comfortable environment in your home, reduces your energy bill and improves your home’s value. 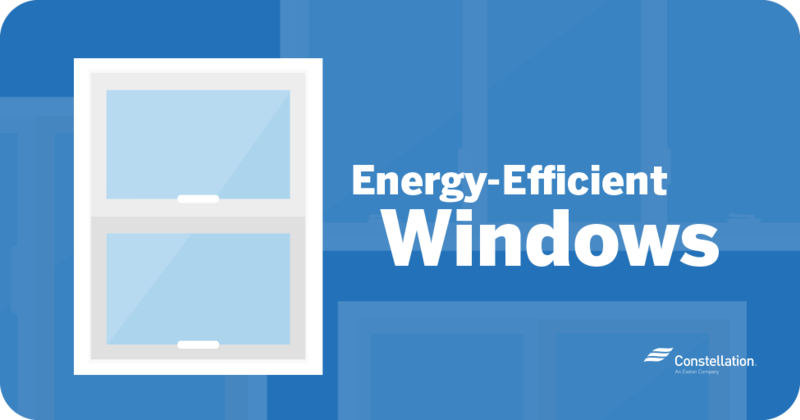 How do windows affect your energy bill? In older windows, outside air can infiltrate through cracks and may cause your heating and cooling systems to work harder to maintain a consistent temperature. This in turn can drive up your energy usage, and have a substantial effect on your energy bill. Properly insulating walls helps, but Energy.gov estimates that up to 20 percent of unwanted external air enters homes through windows. Installing storm windows and ENERGY STAR®️ windows can reduce heat lost to air leaks by 25 to 50 percent. Are your windows wasting energy? Here are some signs that you may need to replace your windows with more energy-efficient alternatives. Your HVAC systems are working harder. If you notice your heating and cooling systems seem to be working harder to maintain the environment in your home, then you may be losing energy through windows, doors, cracks or other openings. An energy evaluation can help determine where you’re losing energy and explain how to fix the problem. You feel noticeable drafts. If you feel drafts when you walk by your windows, you may have a problem. Various types of weatherstripping can reduce the rate of energy loss, but for a long-term solution, you’ll need to retrofit or completely replace the windows. You have condensation on windows. Condensation and moisture on windows may indicate too much humidity in your house, but they could also be evidence of air leaks around the window. Your rooms get hot in warm weather. Do your windows have blinds or curtains? If not, direct sunlight may be heating your home –– especially if you have older windows. If your windows are not energy efficient, they might allow too much heat from direct sunlight into the house. This heat can raise interior temperatures and force your air-conditioning to work harder. Your windows are difficult to open and close. Do your windows open and close easily? If they need to be forced open, the frames may have warped and therefore need replacing. You hear excess outside noise. Energy-saving windows act as sound barriers, absorbing noise from outside before it enters the home. If your windows let excessive amounts of noise in from outside, their energy efficiency is likewise limited. You notice water leaks on window frames. Leaks from your window frames may suggest the need to weatherize your windows. Water that seeps through from the outside may also indicate that the window frame has cracks and may need proper insulation. Increased window energy savings. Energy-saving windows improve HVAC efficiency by preventing heat loss and passive solar heating. Decreased window condensation. Lower window condensation increases personal comfort, allows more light to pass through the window and improves the view. Reduced damage to fabrics and furniture. Proper UV coatings on windows reduces harmful ultraviolet rays that can damage furnishings. Improved room comfort. Energy-efficient windows decrease drafts and reduce unwanted heat from direct sunlight. More peace and quiet. Energy-efficient windows also reduce sound transmission, providing property owners with less unwanted noise. What are window performance ratings? If you’re considering replacing windows, you need to understand how to read window performance ratings. These ratings describe a window’s energy properties and include such measurements as U-factor, solar heat gain coefficient and visible transmittance. While a little intimidating at first, these factors are easy to understand once you know what they mean. Window performance ratings are issued by the National Fenestration Rating Council (NFRC) and ENERGY STAR®️. The NFRC tests and certifies windows, doors and skylights based on their energy performance ratings. Participation in the program by window manufacturers is voluntary. ENERGY STAR®️, in contrast, is a government program with stricter demands than the NFRC. While all ENERGY STAR®️–certified windows include the NFRC label, the reverse is not always the case. ENERGY STAR®️ windows are rated on U-factor and solar heat gain coefficient ratings. How do I read a window energy performance rating? Learning to read a window energy performance rating helps you choose the right windows for your home. Physical location has a significant impact on which aspects of an energy performance rating matter most to you. Pro tip! Check the Efficient Windows Collaborative website for advice on choosing ENERGY STAR®️ windows appropriate for your state. 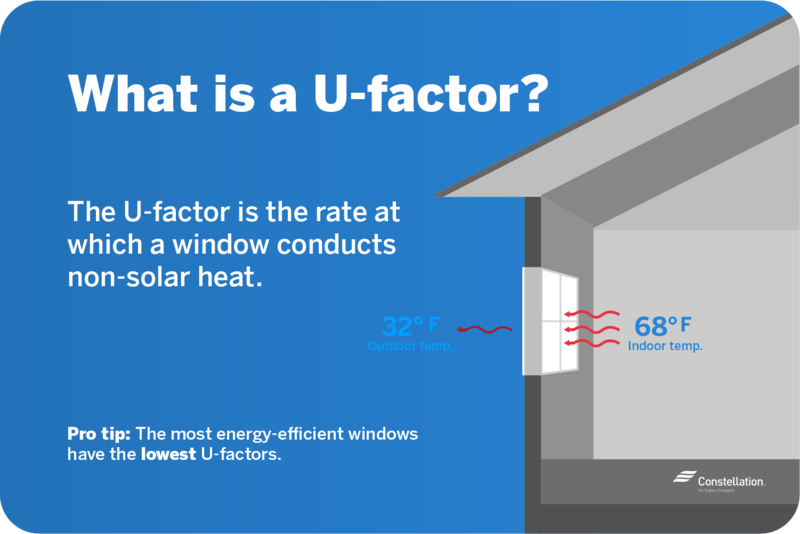 U-factor describes how fast a window conducts heat from inside the house to the outside air. The lower the U-factor, the better the window’s insulating value and the slower the transference of heat. U-factor ratings may refer to the glass and glazing only, but NFRC ratings consider the U-factor of the window frame as well as the glass. Solar heat gain coefficient (SHGC) refers to how much solar radiation passes through a window. SHGC is expressed as a number between 0 and 1. The lower the rating, the less solar radiation passes through the window. Whether you need a high or low SHGC rating depends on your location. Homes in northern climes may benefit from a higher SHGC, which helps transmit the sun’s heat into the home during the winter. Windows with a lower SHGC are better suited to hot, sunny environments. The home’s orientation and proximity to shade trees can also affect how high an SHGC rating is needed. Visual transmittance (VT) describes how much light is transmitted through the window. The higher the visible transmittance rating, the more light gets through. VT ratings include the effect of the frame on light transmission as well as the window glass. VT ratings range from 0 to 1, with most windows having VT values of 0.3 to 0.7. Air leakage is self-explanatory: it’s a measurement of how much air passes through a window. AL is measured in terms of how many cubic feet of air will pass through a square foot of window area, but all you really need to know is that the lower the AL, the less air leaks through cracks in the window assembly. Condensation resistance (CR) refers to how well the window resists the formation of moisture and condensation on the interior surface. CR is rated on a scale of 1 to 100, with higher ratings indicating greater resistance. As condensation resistance is an optional rating on NFRC labels, you may or may not find it listed as part of a window energy performance rating. Which energy-efficient window is best for you? Replacing windows represents a significant financial investment. You therefore want to choose the right windows for your home the first time. Your choice depends on climate, your home’s physical characteristics and your style. Select ENERGY STAR®️. Windows bearing the ENERGY STAR®️ label have been certified to provide all the benefits of energy-efficient windows, including conserving energy, reducing heat loss and protecting property from ultraviolet damage. Look for whole-unit U-factors and SHGCs. Whole-unit ratings evaluate the performance of the entire window, including the frame. Center-of-glass U-factors and SHGCs only rate the efficiency of the glass panes, which can be misleading. Choose windows that match your style! Your choice of windows directly impacts your home’s curb appeal and, by extension, your home’s value. Also, you’ll be looking at as well as through your new windows for years to come—make sure you love the view! Coatings to reduce heat gain. Special coatings and tints can be applied to windows to reduce the amount of light that enters the building. This is an important added protection in bright, sunny climates as summer energy conservation can be challenging. Low solar heat gain coefficients. The lower your SHGC, the smaller the amount of solar radiation that enters the house. Choose low SHGC-rated windows to control how much heat enters the home and reduce the effect of sunlight on your air-conditioning system. Gas-filled windows with low-emission coatings. In cold climates, gas-filled windows with low-emission coatings reduce the amount of heat lost through windows. The gas acts as an insulator, while the low-emission coating reduces the amount of heat passing through the window. Low U-factor. A low U-factor prevents windows from conducting heat from inside the house to the outside air. This helps the window retain a home’s heat on cold days. Low U-factor. Even when it’s not cold year round, it’s important to have a low U-factor to prevent wasting energy. On warm days in temperate climates, simply open the window for better heat distribution. Low SHGC ratings. The most energy-efficient windows for temperate climates have a low SHGC rating to maximize energy savings in both winter and summer. Windows come in a wide range of styles. The style that’s best for you may not be right in a different climate or even a different house. Durability, price and your personal preferences all influence what makes the best energy-efficient window for you. Double-hung windows open by sliding panes up and down. Casement windows, in contrast, open outward like a door when you turn a crank on the side of the window. Casement windows tend to be more energy efficient than double-hung windows. 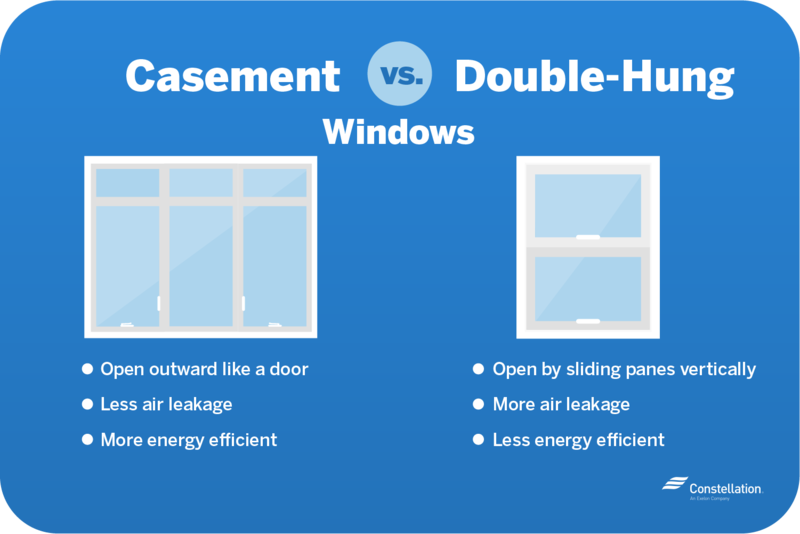 When compared to double-hung styles, casement windows allow less air leakage because the closed sash presses equally on all sides of the frame, sealing the window like a door. Double-hung windows usually only fit tightly on the frame’s side tracks, so air can leak out of the home at the top of the window frame. If you choose double-hung windows, proper insulation can help prevent leakage. Are sliding windows energy efficient? Think about sliding doors—they’re not as energy efficient as hinged doors, which fit snugly on all sides of the doorframe. This comparison extends to sliding and casement windows. Like double-hung windows, sliding windows don’t grip their frames as well as do casement windows, as the sash slides horizontally to open and close the window. 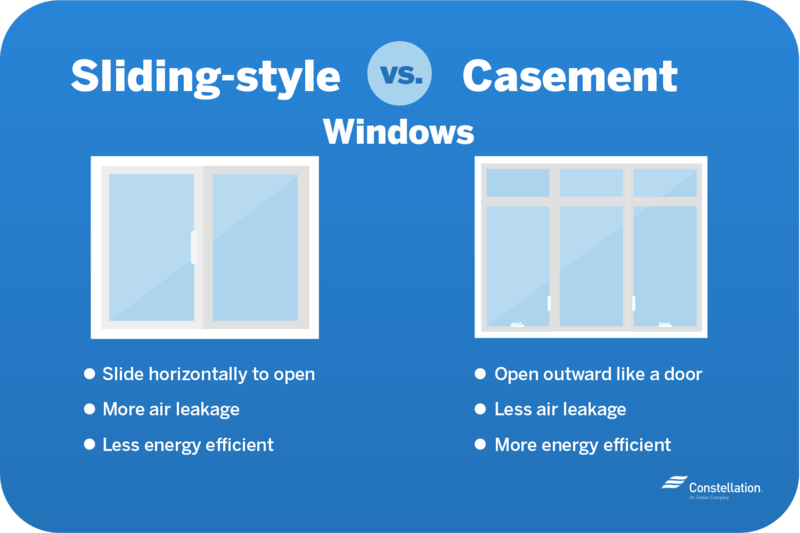 Weatherstripping can minimize air leakage, but if saving energy is your main goal, casement windows win the day. Single-hung windows have only a single movable sash that slides vertically. The upper sash on the window cannot be moved as it can in a double-hung window. 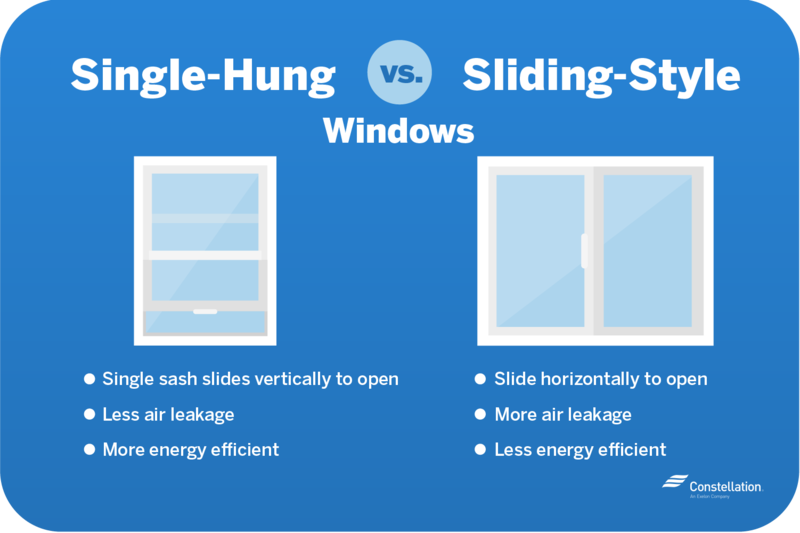 Because only one sash moves, single-hung windows tend to have less air leakage than slide windows. When replacing a window, homeowners have the option of a newly constructed window or retrofit window replacement. The two methods are very different. When you retrofit windows, the windowpane is replaced, but the surrounding framework is left intact. A newly constructed window reconstructs the window’s framework and may require replacing parts of the wall. Of the two methods, installing a newly constructed window is the more expensive option. Retrofitting windows is a less complicated project and generally less expensive than a newly constructed window. As the window is installed in the existing frame, homeowners only need to consider the glass pane’s U-factor and SHGC ratings. Retrofits do have some drawbacks. As the window is installed inside the existing frame, it tends to be slightly smaller than the window it replaces, potentially reducing the amount of solar energy and light that enters the room. It’s also important to consider the condition of the existing frame before retrofitting your windows. If the existing frame is warped or damaged, then an installer may need to repair or replace the window frame to prevent any potential leaks. New construction windows are a more expensive option than retrofit windows, as the original window frame is removed and reconstructed. If the surrounding wood and studs are damaged, they must be repaired before installation, which can increase costs. New window frames, however, are less likely to leak and are often more energy efficient than the frames they replace. New construction windows also tend to offer a larger view than do retrofitted window panes. One of the greatest advantages of retrofitting a window is that the project can be completed by an experienced DIYer. If you’re not comfortable with your DIY skills, a window professional can easily retrofit windows. Replacement windows come in two basic varieties: flush fin and block frame. Flush fins, or Z-bars, are retrofit-ready windows used to replace aluminum windows in homes with masonry or stucco exteriors. Block frames are used to replace existing wood windows. For a successful retrofit, the existing wood frame must be in good-enough condition to remain in place. Below are the basic steps needed to replace windows during a retrofitting project. 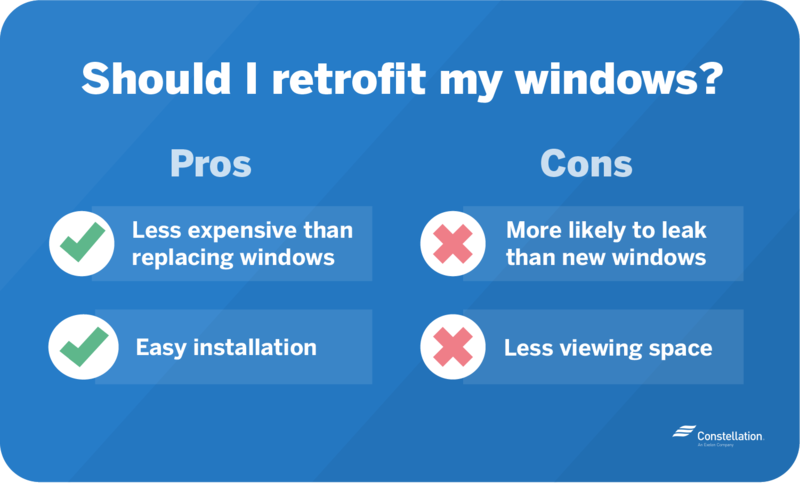 Bear in mind that each window replacement is different. Depending on your project, you may need to take additional steps. Measure the inside of the existing window frame. Remove all old window panels. Place the new window inside the old frame. Check to see if it’s level. If not, the frame may need to be shimmed into place. Use anchors that are the right size. Carefully screw the new window into place. Do not thread screws in too deeply as this can cause damage or leaks. Caulk the sides to prevent air and moisture leakage. Treat casing wood, and insulate if needed. Installing a new construction window is much more complicated than retrofitting and, in most cases, is a matter best left for professionals. However, if you’re an experienced DIYer and are keen to try, here are a few tips for how to approach the task. Measure the height and width of the frame. Remove the old panels and frame. If you have a storm window, remove this first. Identify any stops on the existing window. If you’re installing the window from the inside, remove the interior stops, and leave the exterior ones intact. Reverse this step if you’re installing the window from the exterior. Remove the parting stop and lower sash. Fill all holes with wood filler. Remove and replace damaged or rotten wood. Clean the opening to remove dust and debris. Apply flashing tape to the sill. Dry fit the window to the opening. There should be a small gap around the sides. Set the window aside and apply 3/8-inch beads of silicone caulk to the stops. Place the window in the opening, resting it against the remaining stops. Press firmly against the caulk. Check level, adjusting with shims as needed. Screw window into place through the shims. Ensure the window opens and closes smoothly. Cut the shims. From the exterior, spray foam insulation into the gaps surrounding the window. Install the sill adapter and the exterior trim, and then caulk. Get the right-size window. Weather can expand and contract wood, so take that into account when choosing your window size. Be sure the window is level. If the window is not level, the sash might not close properly, and that won’t provide a proper seal. Beware of improper frame support. Be sure you have the proper amount to support your new window. Have adequate attachment supports. Be sure to use anchors that are the right size, and make sure you install them deeply enough to hold the window in place correctly. Don’t overpack insulation. Too much insulation can distort the frame. Choose the right caulk. Picking the wrong caulk can allow moisture to get in and create water damage. Treat casing wood. Be sure to treat any bare wood that is exposed to the elements so that it does not warp or deteriorate. Installing a window—especially a newly constructed window—is a complex task. Don’t be shy about hiring a professional if you don’t think you can complete the project yourself. You want the installation to go right the first time. Replacing old windows with energy-efficient models has so many benefits. You’ll reduce the amount of energy you waste, have a more comfortable home and improve your curb appeal. It’s an investment that’s well worth the cost! Interesting huge post, article very useful, recommend it. Hi Jeremy, thanks! Glad to help. We recently replaced 17 single pane windows in our home. The furnace is running less, the outside sounds like the school bus, lawn mowers and leaf blowers don’t penetrate the indoor environment any longer. I can sit at my desk for hours without getting chilly! We haven’t had cold weather yet and we’re less than a month into the change, so we haven’t seen a difference in our bills yet. But I’m excited about seeing the difference! Linda, that’s so great to hear! Thanks for sharing your experience with us.